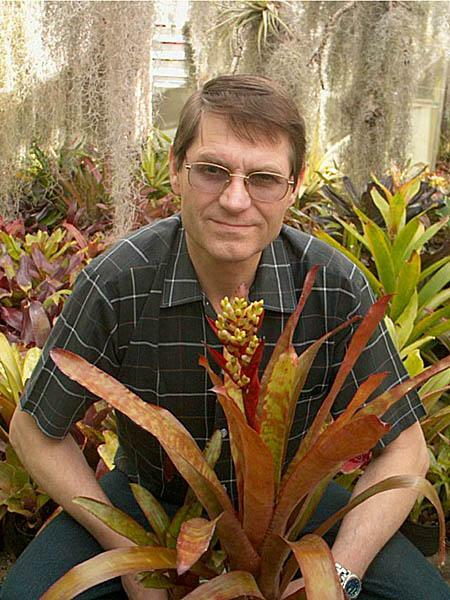 Following current BSI Cultivar Registrar Derek Butcher’s initial idea for the BSI to formally recognise the achievements of bromeliad hybridists and to encourage more cultivar registrations, the Board of Directors approved the creation and trial of this biennial award at its June, 2003 annual Board meeting. An interim proposed set of award criteria (to be ratified by the Board) was printed in JBS 53(5):213 (Sept./Oct.2003). At the WBC Chicago Banquet, newly-elected President Joyce Brehm announced the winners for their cultivar registrations for the preceding 2-year period (Jan. 2002-Dec. 2003) were John Arden (California), Sharon Petersen (Hawaii) and Vic. Przetocki (Western Australia). Regional Conference delegates accepted the Award Certificates and letters of appreciation on behalf of these first-time recipients who were not in attendance. Congratulations to these bromeliad breeders, altogether from contrasting backgrounds and with different goals, who have penned their own profiles here. Sharon Petersen with her two loves. I began acquiring a few bromeliads in the mid 1980’s. Soon I became an insatiable collector. Every grower, nursery, garage sale, or mail order source was explored and utilized as I sought to learn all I could about this exciting family of plants. People moving to the mainland or retiring to a condominium could expect Sharon to haul away their entire collections. I joined the Hawaii Bromeliad Society and served as vice president and then president. Eventually I realized that I had amassed a truly extensive “gene pool” of both species and hybrids and perhaps should try to creating some new hybrids myself. 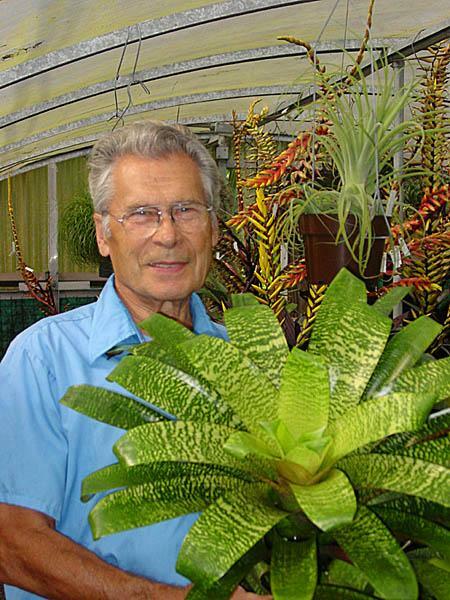 I consulted a friend, Hatsumi Maertz, one of the founding members of the Hawaii Bromeliad Society and a noted hybridizer, about the fine art of hybridizing. Hatsumi was happy to teach me how it was done and even supervised some of my earlier hybrids. I was amazed at how well it seemed to be working! My zeal for hybridizing soon replaced my compulsion for collecting! A back injury in 1994 confined me to only light work and I used the time to hybridize full time. I was able to plant out 800 crosses from that year. More greenhouses were built over the next few years to house the colorful new hopefuls and just as they began to reach maturity-disaster struck! A worker applied foliar fertilizer six times too strong. In a matter of days it looked like they had been hit with a flame thrower. Hundreds rotted and died immediately, while others lingered and struggled to produce a pup or two. It took over two years to recover from the damages. When things improved and a new crop of salvaged pups and replacements were starting to color up–workers spraying nearby, managed to drift the herbicide, Roundup, through several of the greenhouses, one breezy afternoon. Again I had to start over, salvaging what pups I could from the dying mothers and growing a new generation. A third disaster came in the form of an adverse reaction to an insecticide and while it didn’t kill the plants, it made them bloom prematurely and pup. In all, it has taken me ten years to produce the hybrids that I am now registering. (I was beginning to think God didn’t want me growing any new bromeliads!) Finally now, I am actually able to see the results of my labors. Although I did “have a dream”, I was shocked at the amount of grit and determination it would take to see it realized. As with any success, I did not do it all on my own. Good friends were there to support and encourage me. Hatsumi Maertz, David Shiigi and Cheryl Basic were all there to bolster me through some of the hard times. When I had stopped hybridizing, another good friend, Ray Coleman, treated and sent me a plant ready to bloom, knowing I could not let it go to waste. Sure enough, he got me back to hybridizing again. Although I have worked with Vriesea, Aechmea, Billbergia, Cryptanthus, and other genera, my main focus and continued favorite is still, the Neoregelia. I have registered about 80 new hybrids and have a good number of others still “in the works”. John Arden with one of his hybrid Vrieseas. Born 1926 in Latvia. After graduating from basic education, I entered in Forestry Service School. A year later, due to WW II, I was forced to flee communism and went to Germany. After the war, I worked for the US military in civilian capacity. Came to the US in 1951 and have since been living in Southern California. I worked most of my life as a machinist for the aerospace industry in the Los Angeles area. My hobbies are hiking, exploring and photography. I have exhibited my photographs in International Salons. I climbed Mt. Kilimanjaro in East Africa at the age of 50. I then, discovered bromeliads and my other hobbies faded away. I then joined the South Bay Bromeliad Associates and have been a member since. One year after joining the Bromeliad Society, I started hybridizing. I then retired and moved to Vista, San Diego County in 1988. My hybridizing work flourished here. In 1996 I was forced to stop hybridizing. I simply ran out of space to grow the hybrids. Seven years later I restarted very limited hybridizing. Now, I no longer am involved with growing the hybrid seeds. I am fortunate to have good friends who will grow them. Presently I have 500+ different hybrids in my possession. As of August 2004, I have 80+ registered hybrids in my name. My hybridizing work was done mostly with Vrieseas, however there have been also some Tillandsia, Vriesea x Tillandsia and Vriesea x Alcantarea crosses made. Vic Przetocki with Aechmea ‘Kimberley’. Vic Przetocki: I was born in a country town east of Perth, Western Australia in 1951. My parents shortly after decided to move to Perth. At the ripe old age of 18, I joined the Royal Australian Navy. In 1975, one year after being back in civilian life, I met my wife to be Yvonne. 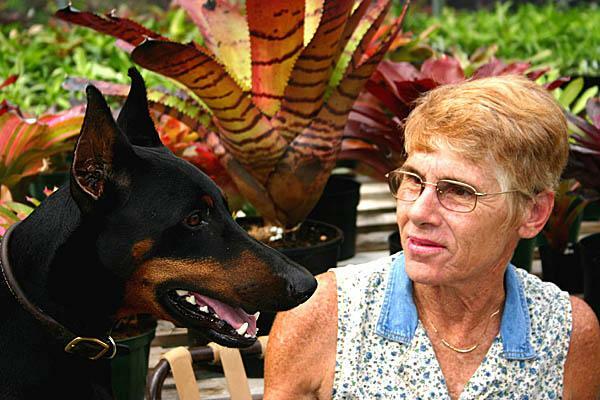 I began growing bromeliads in 1979 and joined the Western Australian Bromeliad Society in 1982. Since that time except for a one-year period, I have held various positions on the committee. The Society in 2003 honoured Yvonne and I with Life Memberships and it is something we will always cherish. I began seed propagation in 1982 but began hybridising in earnest in 1983 and so far have registered 117 cultivars on the BSI internet site. My residential block is 780 square metres in size so I have to be ruthless with my seedlings and if good enough tend to name about three plants from each cross. I have created Aechmea, Billbergia, Cryptanthus, Neoregelia, Orthophytum, Vriesea, intergenerics and Tillandsia hybrids, of which the latter I have only just started. Lack of space is becoming an issue and I have slowed down creating new crosses but there are enough still in development to keep me busy for the next 5-10 years. Whenever Yvonne sees me drying seeds now, she says, “I thought you stopped hybridising”. My problem is that if I see two plants that I think have the potential to create something of beauty, then out comes the tweezers and pollen brush. I would like to thank the BSI and appreciate the Bromeliad Cultivar Registration Award given to me in recognition for my contribution towards the betterment of bromeliads.